Do we have a 7th Sense? If so what form does it take? The answer to the first question is probably ‘no’ but what we do certainly have is an online slot with that same name; 7th Sense has some traditional looks, it’s designed by Espresso Games and it comes with two bonus features. 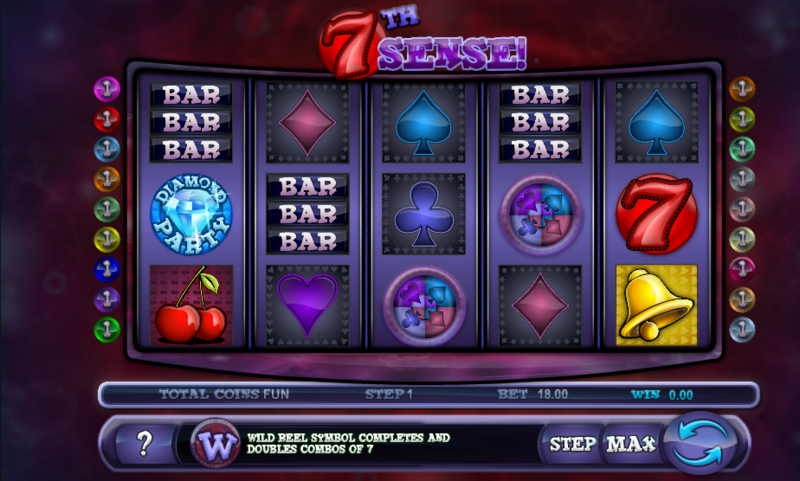 7th Sense is a five reel slot with three rows and eighteen fixed paylines; there’s a cartoonish design to the game and the symbols spin in a colourful but darkly atmospheric environment which is complemented by an entertaining soundtrack. Red, yellow and green sevens make up the higher value symbols along with bells and cherries; the lower values are represented by the four playing card symbols plus a triple bar. Wild symbols are designated by a big blue ‘W’ and they will fill up all positions on a reel when they land; the wild will only complete winning combos for the three ‘seven’ symbols. The diamond and the combined playing card icons are bonus symbols. 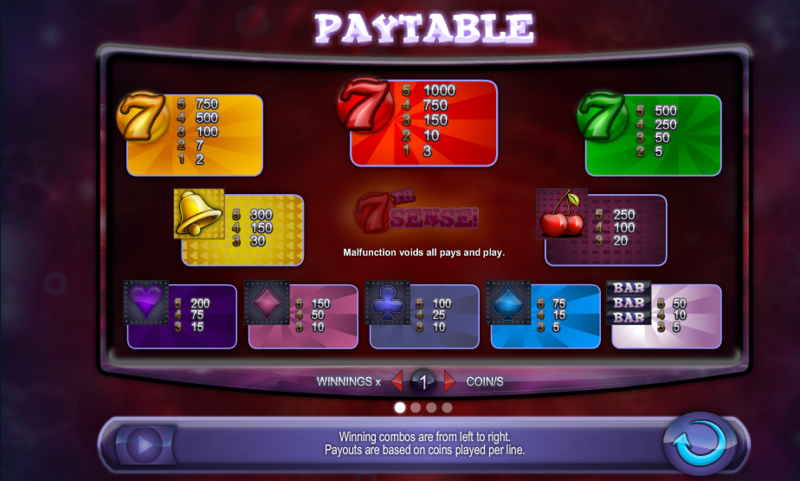 This is triggered by landing three of the Diamond Party bonus symbols anywhere on reels one, two and three; you will now receive seven free spins on a set of reels containing only diamonds of ten different colours. The wild symbol will complete winning combo for the blue, white and red diamonds only (the three most valuable). Trigger this by landing three of the combined playing card bonus symbols anywhere on reels three, four and five; now spin the Wheel of Fortune to determine the number of free spins and the bonus suit. When the spins are underway any symbols which match the bonus suit will pay out your bet. 7th Sense is an enjoyable game with some basic but fun graphics and various bonus features to aim for; leave the sound turned on to ramp up the atmosphere a bit.